The Cape Elizabeth is a gorgeous combination of charm and elegance. Overflowing with a fragrant mix of balsam, cedar, and pine. 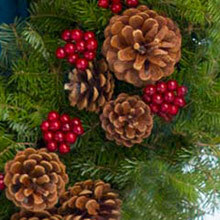 Materials: Balsam Fir, cedar, pine, pine cones, clusters of faux red berries and a hand-tied cranberry linen bow. 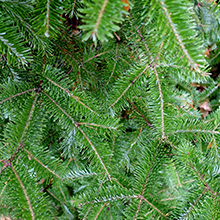 Balsam Fir has a sweet evergreen scent and is a top pick for wreaths and Christmas trees because of its strong fragrance and rich, beautiful green color. We use only top quality decorations on our wreaths. Our custom made faux berries are the highest quality and very realistic! Our ribbons are made especially for us. 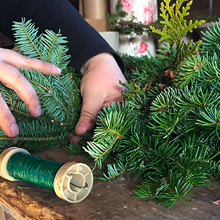 We hand-tie each of our bows and use wired ribbon so they can be fluffed or shaped to your liking when it arrives. 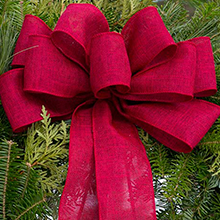 Made to order the day of shipping, for maximum freshness, our wreaths last through the holidays, even in warmer Southern states! This is the second (or third) time I've ordered a wreath from Harbor Farm and as in prior years, the wreath arrived in perfect condition, ready to display. The wreath looks (and smells) wonderful. Thank you from someone in the Midwest who LOVES Maine wreaths! Beautiful wreath - nice plant material and arrived in good shape! This wreath is even more gorgeous in person! This is my first year ordering from Harbor Farm and my husband & I have decided to make it a yearly tradition. The quality is amazing!